Why is this module needed? This module replaces the older Database Integrity module. It offers a few simple, quick tests to run on your Form Tools installation: kind of like taking your car to get it serviced - except this is free! File Verification - this examines the Core, modules and themes to check that all the files have been uploaded properly to your site. 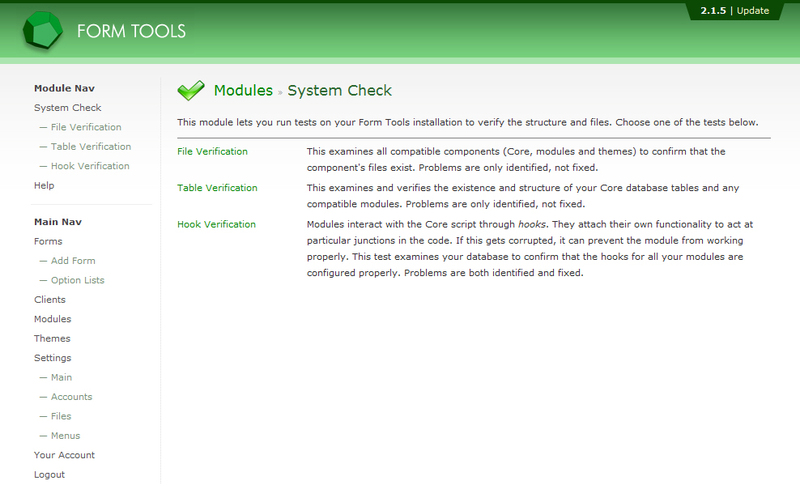 Table Verification - this examines the structure of your Core and module tables. Hook Verification - this checks to make sure the module hooks are all correct. Orphan Clean-up - this identifies and removes old, dud database records and references. 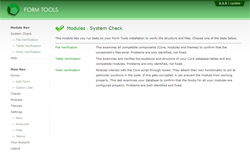 The System Check was designed to be compatible with the old Database Integrity module, so you can simply install this module and run the same tests as offered by the older module. However, the File Verification test is newer: you will need to upgrade your modules and themes to be able to run those tests.